Jazz lives deeply in Chicago, with a rich & powerful legacy… much like tap in Chicago, but for me it is one that feels somewhat invisible. perhaps it’s just me. nonetheless this tap legacy is one that -after witnessing Chicago Human Rhythm Project‘s vibrant showcase- provokes the need for serious research and further excavation to understand the depth of its history…. 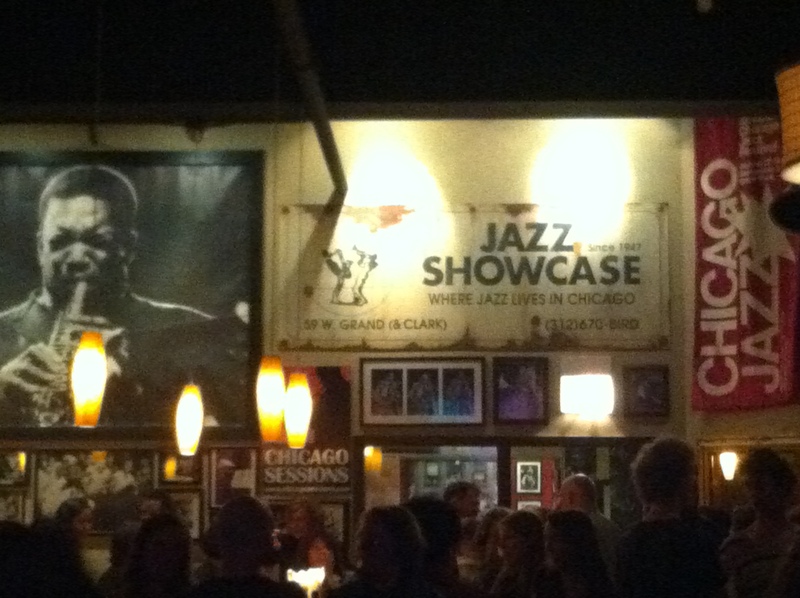 this past Monday night, at the wonderfully intimate and warm Jazz Showcase , Chicago Human Rhythm Project [CHRP] presented a brilliant showcase where “the ‘pros’ and ‘ams’ came together”. the impressive Lane Alexander, co-founder & director of CHRP, has brought together an incredible group of tap artists from around the world for this festival; in its 23rd year dubbed “Rhythm World”. inside this world some will teach, others to learn, to perform…many will do ALL of the above. tonight it’s a true mix of up & coming with masterful artists. walking into the entrance you can already feel the buzz and anticipation for what’s to come. and ambiance! the space: resonant and low-lit with images of famous musician performers from the past. the present: a trio of musicians offering distinctive jazz standards, medleys & mashups; complementing the explosive tap percussive rhythms. and what better way to create ambiance for the tap to come than to have live music! 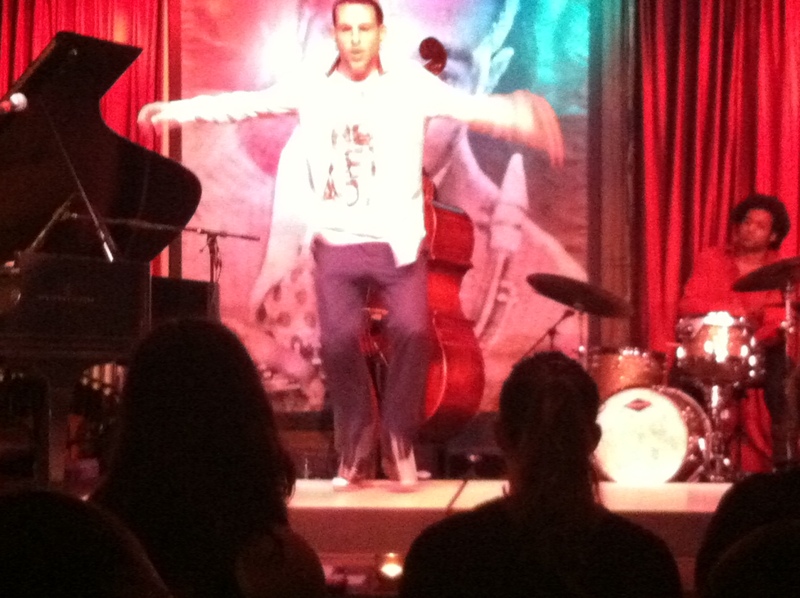 especially with the stellar jazz trio led by Greg Spero on piano, Junius Paul on bass and Makaya Mccraven on drums. inviting and compelling. the stage is set…rather a floor has be set on top of the legendary stage of the Jazz Showcase – a staple for kool vibes and koolness all around since 1947. students, teachers and masters of tap have assembled with lovers of tap to witness, be part of and take part in this JAM. Lane welcomes us then introduces our host for the evening, Stomp’s Lisa La Touche. she smartly articulates what’s about to happen, who’s about to come up and offers up nicknames, tidbits and small anecdotes to give further insight into this expansive spectrum of artists & artistry. with closed eyes listening, i wonder as it begins ‘to stomp or not to stomp’: how will each tap artist share their unique sensibility? #3 NYC based (Samara & Christina female duo) ‘flava’, communicative to musicians & each other, at points contrapuntal, awakened improvisatory sensation that continues to reverberate throughout the evening. #5 N. Carolina (Adriana) seeking to rise to above a challenge. setting the tone for the musicians, began sans music, a sweetness arose, in phrasing in expression, exudes the freeness of free jazz. #6 Chicago/Boston (Ian/M.A.D.D Rhythms) relentless, confident, syncopated, TALL. #7 Vegas & Australian international duet (Winston & Victoria) him from Melbourne, she living in Vegas. dressed in slacks & collard shirt, all black with dreads, he lays the foundation, hips slightly swaying curving inside the contours of the steps. she of comfort leggings & t shirt, much taller but light and smiling, pounces on top of his smoothness. they finish each others sentences. ends in a layered dense satisfying simultaneity of his and her feet coming together. #8 Chicago/N. Carolina ‘national duet’ (Luke & Donnetta) he white, she black both young and vibrant. bass begins, snaps ensue, they go! catch where one ends and take it somewhere else, dazzling footwork (hers),how he lays into a step. summertime and the livin is easy floats inside the musical renderings…she of footworKINGz he the “Justin Beiber of tap”. #9 Chicago (Star) closes out first half. young & beautifully hip with her tap boots & leggings, her multicolored long tresses. a sincere koolness, she says hi to us sweetly and then works it out on the floor! laughter, joy emanates, playfulness, with moments of complex and fast fast footwork. BREAK. stage ‘cools off” room buzzing with what has been experienced. excitement for who’s to take the stage next…. as #10 Canada (Lisa), proudly proclaiming her “Canadianness” the hostess opens up the 2nd half, contributing her own flair to this richly diverse tapestry of tap. quite clean and graceful. #11 Japan is in the house! 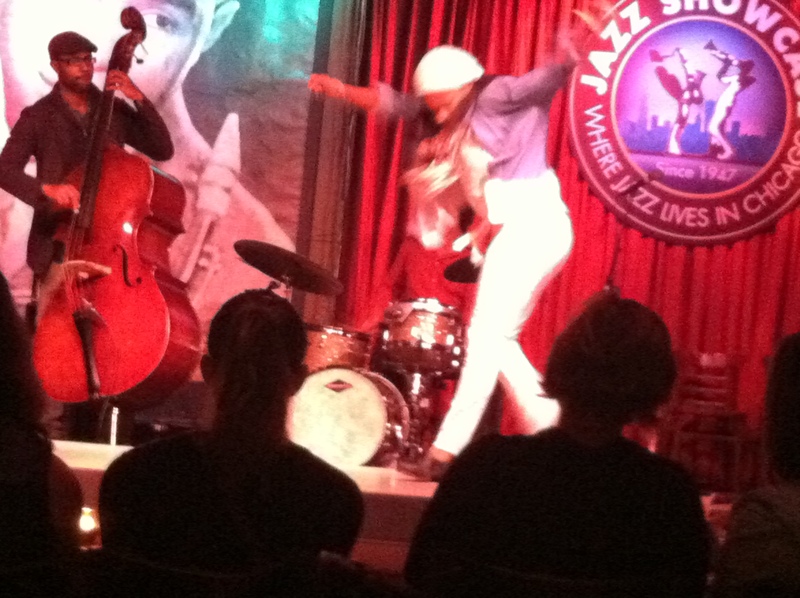 (A trio) probably reppin the youngest tapper of the evening, she is quick and on point with her percussive footwork. two other older but still young men transmit and transcend moments of interplay between the three. 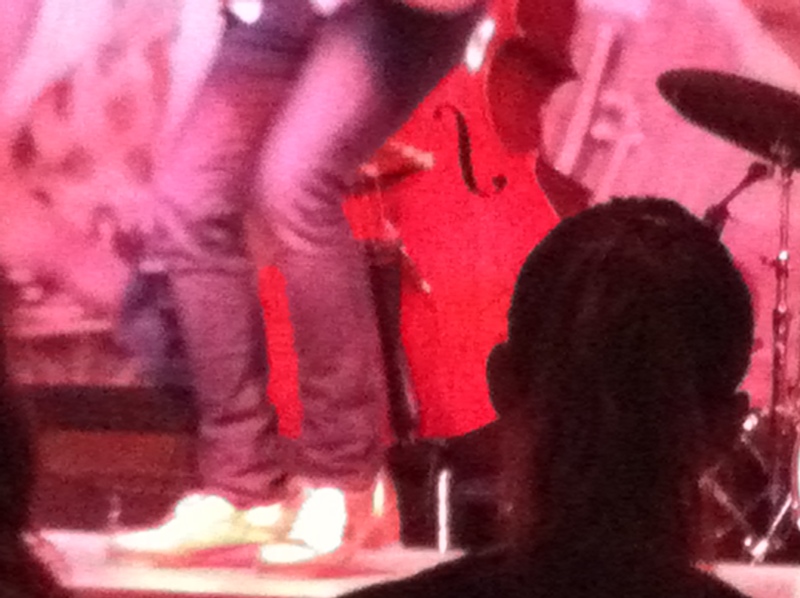 snippets Route 66 drip inside the arrangement and they finish with a “bow” to the audience and musicians. #13 Ohio/NYC/Chicago (Sarah) fresh from working alongside Savion Glover, gives the “go ahead” to the musicians..”I like that” she shares with us as the smile grows and the feet get to moving. sporting a “skull & crossbones” shirt, not at all symbolic of her feet that are so alive! she shimmers her way to end and curtsies. #14 Chicago/Riverdance (Tre) nonchalantly drops his keys on a nearby table and with his white patent leather shoes gives full on tap swagger. #16 Touring the world /Chicago (Nico) though i thought i heard “Rico” and with all intention he gives the best form of “suave” tap one can imagine. it is finessed. it is smooth. #17 NYC (Jason) New Jersey born he boldly takes the stage. stomps, commands. ‘kicks up dust’. contends with the drum. tracks the beats, becomes the beat. an intensity of focus, an exquisite articulation and expression that inspires a mash up of music, an ’empire state of mind‘. Chicago Human Rhythm Project’s 23rd annual Festival performances at Museum of Contemporary Art Chicago, Wednesday, July 31st, August 1st and 3rd.